Demonstrators gather outside the dental practice of Walter Palmer, who returned to work, Sept. 8, 2015, in Bloomington, Minnesota. The U.S. dentist who killed Zimbabwe's famed Cecil the lion returned to work Tuesday after spending weeks avoiding the public and media over his controversial hunt. Walter Palmer entered his Bloomington, Minnesota, dental office Tuesday morning, passing through a small crowd of protesters and reporters gathered out front. "He's disgusting. He's despicable," said protester Cathy Pierce. "I mean how many lions do we have left? Do you have to kill them all? It's not right. It's just not right." FILE - Cecil, a well-known, protected lion who lived in Zimbabwe's Hwange National Park, is seen, November 2012. In July, Palmer killed a rare black-maned lion, affectionately known as Cecil the lion, who was being tracked with a GPS [global positioning system] collar as part of an Oxford University research project. 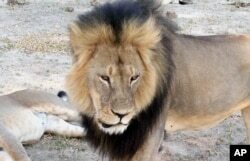 Cecil was a well-known fixture at Zimbabwe's vast Hwange National Park. In an interview Sunday conducted jointly by the Minneapolis Star Tribune and The Associated Press, Palmer said he and the other hunters in his party had no clue the lion was the revered feline. "If I'd have known this lion had a name and was that important to the country, or a study, obviously I wouldn't have taken it," he said. "Nobody in our hunting party knew before or after the name of this lion." He said the ordeal has been particularly hard on his wife and daughter. The 55-year-old Palmer declined to say if he would abide by any request to return to Zimbabwe to face any legal repercussions from the hunt. Zimbabwe officials said back in July that it would request his extradition, but no charges have been filed.